A drive is a good technique for hunting mature bucks, especially once deer have been pressured and have retreated into dense cover. With most methods a hunter tries hard to hide from deer, but a drive functions just the opposite way. A group of drivers enter a thick area thought to harbor deer. They break all the rules of stealthy hunting. They go in with the wind at their backs, which sends their scent toward the deer. The drivers walk fast, talk and sometimes yell to make sure the whitetails know they are coming. Of course the plan is for deer, traumatized by the sudden, noisy intrusion into their domain, to get up and flee in the opposite direction. But unknown to deer that do so, other hunters, called standers, have quietly circled around and taken stands at the far end of the drive area. The wind is in their faces, and they have selected posts with good visibility. Sometimes fleeing bucks are so preoccupied with the racket behind them that they trot past a hunter on stand, offering a shot. Of course the point of a drive is to flush a buck into pre-appointed area where a stander can get a good shot at him. Hunters making drives usually know each other well and enjoy the team effort. One or 2 hunters who know the terrain and hence where to strategically place the standers (the shooters) and the drivers (the people who flush the deer) lead the drive. Drivers use different strategies. The pushers can canvas a cover in a circular pattern, pushing deer toward a shooter in a tree stand in the center of the circle. Or one driver can walk slightly ahead of the other drivers, banking on the knowledge that a buck will most likely circle around to get the downwind-and bump into other drivers waiting behind. Most of the time drivers spread out in a straight line and march forward, giving deer no way to run except toward the standers waiting on the opposite end of a cover. 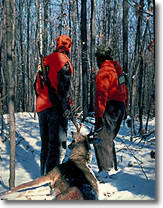 A buck’s attention is so fixated on the drivers he fails to notice until it’s too late that he has fallen into a trap. Still, mature bucks are sneaky; some find a way to circle back between the drivers. Obviously dense covers that concentrate deer are the best spots to drive. A good drive area would be an isolated pocket of thick cover no larger than 30 acres and bordered on the sides by a field, river, etc. If a drive area is too large, bucks will be able to circle back and avoid the drivers as they move through. And unless a drive area has some bordering terrain that a buck does not like to cross, such as an open field, deer might slip out the sides of a cover without being seen. The wind plays a large role in drives. On certain days certain areas are not good for drives because the wind blows at the standers’ backs, sending their scent back into the cover and thereby alerting deer. Then a buck would figure out that humans are not only behind them making noise, but also somewhere out front. There are 2 basic techniques–a loud drive and a silent drive. Both work well, depending upon what the hunters are trying to accomplish. During a loud drive the pushers talk, yell, bang trees with sticks and maybe even bark like dogs. The purpose obviously is to alert deer long before the drivers get close. Two reasons. First, the turmoil confuses and causes them to flee en masse long before the drivers get too close. This tactic can help to eliminate a wily buck’s knack of circling back and trying to escape out the back door. A loud drive is usually best in a large, thick cover. The purpose of a silent drive can be two-fold. First, the drivers might have an opportunity to harvest a deer while moving toward the standers. Silent drivers often still-hunt through an area, moving slowly and quietly to engage deer and possibly get a shot. If a buck’s sees or smells the drivers, he moves out toward the standers. Secondly, many hunters like small, silent pushes because buck don’t get too spooked. A couple of drivers still-hunting along with the wind at their backs can force deer to get up, but they don’t bust out of the cover. They try to slip quietly out of the cover out front, often walking into the sights of stander. A silent drive works best in a small area where there’s less chance that deer will circle around the pushers. Anytime people with guns are concentrated in a small area and moving toward each other, there are strict safety precautions to keep in mind. During gun season both drivers and standers should wear fluorescent orange. In the tight confines of a cover, drivers should keep each other in sight at all times. Drivers and standers must handle guns safely. Before a hunt, everybody should meet and discuss things like direction of the push, safe shooting lanes, etc. Make sure all drivers and standers are on the same page. When practical put shooters in tree stands. They’ll have a good view of approaching drivers and bucks. If they shoot at a deer, the bullet or slug will spiral downward and away from the drivers. In recent years bowhunters have discovered that they can score by modifying the standard gun drive. Archers refer to their low-keyed method of driving as “nudging.” As the term indicates, the drivers slowly push through an area, often still-hunting as they go. The deer become aware of their presence, but they usually aren’t too alarmed. So bucks trot or walk out front of the nudgers and toward the standers. To have a reasonable chance of scoring, a bowhunter needs to shoot at a deer standing broadside or moving slowly within 30 yards. To get a good shot like that, a stander might set up near the lip of a gully, a large fallen trees, etc. A terrain feature like that can cause a pushed deer to hesitate and stop for a few seconds, offering a shot. Also, a stander should keep a deer call handy. Even running deer have been known to stop dead in their tracks at the sound of a grunt or bleat. As you might expect, nudging allows quite a few deer to slip back through the drivers. But that is the price archers must pay to nudge the deer toward the standers rather than running them past in full flight. For gun hunters, the greatest advantage of driving is to move pressured deer late in the season. . A drive can be a good way to get a fleeting crack at big bucks that have turned nocturnal and spend their days entirely in thickets. Too, the bowhunter who does some slow “nudging” can expect action with a decent chance at a buck. No doubt, a loud gun drive really spooks deer. Once you put on a drive or two in an area, you must write that spot off for stand hunting or still-hunting because deer will be off their normal movement patterns. For that reason many drives are conducted during the last few days of hunting season. Even using the silent nudging technique, deer don’t always cooperate. Bowhunters can experience big-time frustration when dandy buck runs by them at 15 yards, or slips past just out of arrow range.